Lo Romero Golf is a great location to buy a golf property in the popular Costa Blanca South region of Spain. 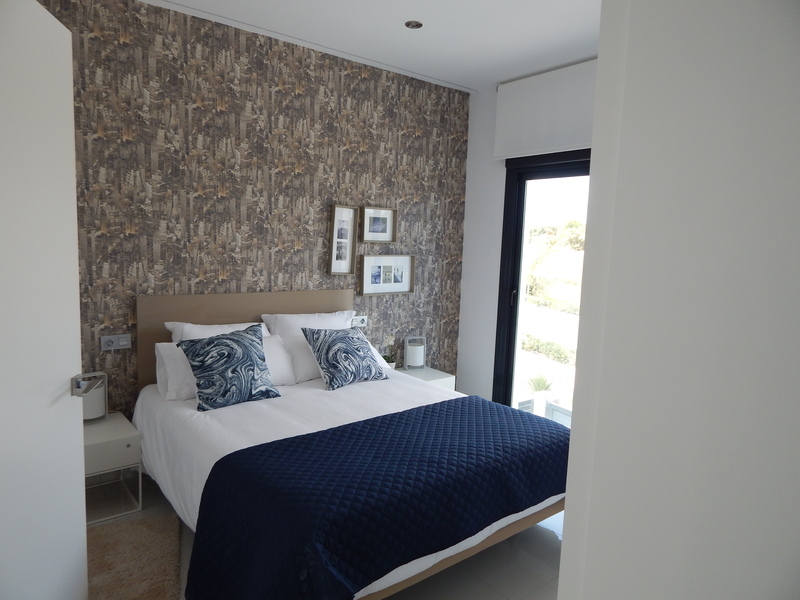 Lo Romero Property offer a large selection of new golf apartments and golf villas that are all situated in an exclusive golf environment providing stunning views over the local area and coastline of the Costa Blanca and Costa Calida. Pilar de la Horadada is located in a privileged place in the Vega Baja area, in the province of Alicante, in the east of Spain. It is the most southern town in the Comunidad Valenciana and is on the natural border of the Region de Murcia. Lo Romero Golf is referred to as the “The golf island” a name that it has been referred to since its inaugration.¨The Golf Island¨ is actually situated on the 18th green, which is a level circular green surrounded by water with a foot bridge for access to the green. From the first Tee shot to the last putt, you can enjoy a round of golf in a natural tranquil environment. Lo Romero Golf is the perfect course for golfers who are passionate about golf and the Island of Golf is an ideal course for golfers of all abilities. Lo Romero is in the municipality of Pilar de la Horadada and a few kilometres from Murcia. Pilar de la Horadada and its neighbouring area has many quality beaches. Choose the one that best suits you: El Mojón Beach (frequently visited by fishermen, it has a promenade with a white balustrade); Higuericas Beach (with access for disabled, large parking lot and recreational area for kids both in the sand and in the water. Nice promenade to walk or ride. At nights, the parking lots are used for concerts organised by the Town hall; Las Villas Beach (with fine white sand and crystal clear water and the Sardinero Promenade that goes until Jesuitas Beach); El Puerto Beach (access from the Port, where we find the Nautical Club that organises sailing courses and regattas in summer); El Conde Beach (with fine sand where you can take a relaxing bath under the Lookout Tower. ); Los Jesuitas Beach (large cove with volleyball net; between this beach and the first cove of Rocamar, there is Puntal de Gato, from where you can appreciate a panoramic view of Pilar de la Horadada coast). Rocamar Beach (small coves that inspire a lonely walk); Río Beach (Its named after Río Seco (The Dry River) that follows into this beach, guiding the hikers that want to get to the natural area of Pinar de Campoverde); Mil Palmeras Beach (accessible for disabled, with plenty of services: recreational area for kids, small boats rentals and hammocks rentals among others. During the summer nights, the promenade is occupied with craft market stands that close by midnight); Vistamar Beach (with a precious promenade crossing the natural halls of the rock that the tide has formed over the years). For bike enthusiasts, both with family or relaxed, bike riding offers nice and easy routes, especially by the coast. There are many promenades, adapted for riders, that allow you to go across the coast safe and take breaks at the beach. Mountain biking around Pilar de la Horadada and the surrounding area offers routes with different levels of difficulty and distances. Different dirt roads and paths link the town with Pinar de Campoverde Urbanisation, with routes through nature reserves. Pilar de la Horadada (Alicante – Spain ), an hospitable and relaxing land, was in Roman times a popular route for the travellers moving from the Mediterranean Coast to Rome. Also known as ‘Thiar’ by the Romans, this town located between Ilici (Elche) and Cartago Nova (Cartagena), has a rich coastline of boating activities, and as a strategic coast region, it enhanced the pirates interest. And for this reason, there are three guard towers that are still conserved: One of them: “Torre Horadada” (Perforated Tower): named after the holes connecting the different levels of its construction that allow a better communication among the many lookouts inside. Nowadays, Pilar de la Horadada conserves parts of its history within the walls of the museum Museo Municipal Arqueológico-Etnológico Gratiniano Baches. Visit it or walk around looking for the church Nuestra Señora del Pilar or Nuestra Señora de la Asunción or just enjoy a wonderful promenade until arriving at Torre Vigía, declared a Good of Cultural Interest. The closest train station is Balsicas-Mar Menor, in the province of Murcia, approx 20 Km.